A version control system has always been a critical tool for developers who need to make frequent changes in code files as per changing project requirements. However, a version control system is not just about code files; for managing any file that changes often, there is scope of version control. Subversion (SVN) is an open source version control system that lets you manage several types of files, directories, and changes made to them over time. Developers use SVN to maintain current and historical versions of files, such as code files, web pages, and documents. Subversion maintains a centralized repository for files and allows access to the repository across networks, thereby fostering collaboration and speeding up project progress. 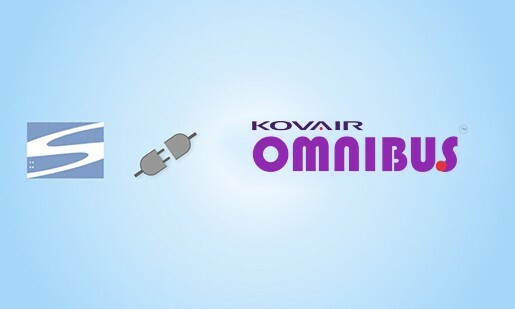 Kovair provides a vendor-neutral ALM platform called Kovair Omnibus Integration Platform to which you can connect your SVN instance using Kovair SVN Integration Adapter. 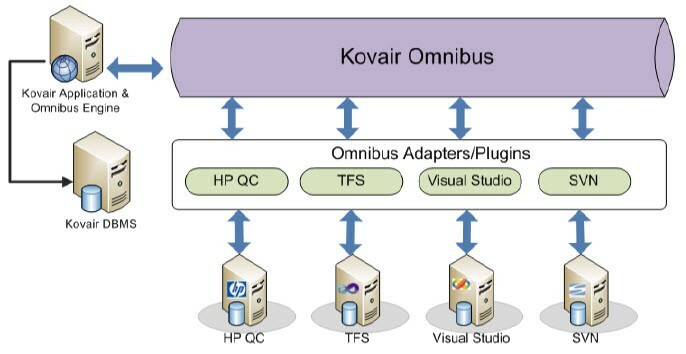 This integration makes information about SVN files and changesets accessible from any tool connected to Kovair Omnibus Integration Platform. SVN changesets can be linked to any Requirement or Defect item in any integrated tool to establish traceability. Throughout the lifecycle of an application, the source code files keep changing; existing files are modified, new files are created, and old files are deleted. Typically, several developers work from different workstations on the same and/or different files. As a result, keeping track of every change and preventing one user from accidentally overwriting the changes made by another becomes a necessity. SVN has the built-in source code control capability to allow multiple developers to work on the same project/ project files at the same time. When SVN is integrated into the ALM system by means of Kovair SVN Integration Adapter, SVN events like change set creation are propagated to other tools. Visibility is gained into specific files and file versions that are being worked upon for a particular requirement, change request or defect. As a result, different stakeholders can get visibility into SVN changes without having to navigate away from their preferred tool environment. changeset information and associate the changesets to the corresponding change request or defect in another tool. Thus, any change in any of the code files can be traced to the change request or defect that triggered the change. releases that are still being widely used and merging files from different releases. Therefore, it is imperative to keep multiple versions of the source code and other necessary files well within the reach of the developers. SVN integration addresses this requirement and allows developers to access information about specific versions of code files from their development tools. Writing documents is basically an iterative process that may involve multiple authors and multiple reviewers. Documents keep changing hands and each document can have multiple versions. Therefore, a document management system must allow network based access and provide version control capabilities. Also, since software projects involve several documents in every stage, having a flexible directory structure for storing documents becomes a necessity. SVN is capable of meeting all the requirements of a document management system and is hence worth being a part of any software development project. Kovair SVN Integration Adapter helps you integrate SVN with other development related tools and avail the document management capabilities of SVN. application development life cycle. By integrating SVN with other tools in the ALM system, you can ensure that all the changes in any of the files can be traced to its originating cause – be it a fix for a defect or a change request implementation. 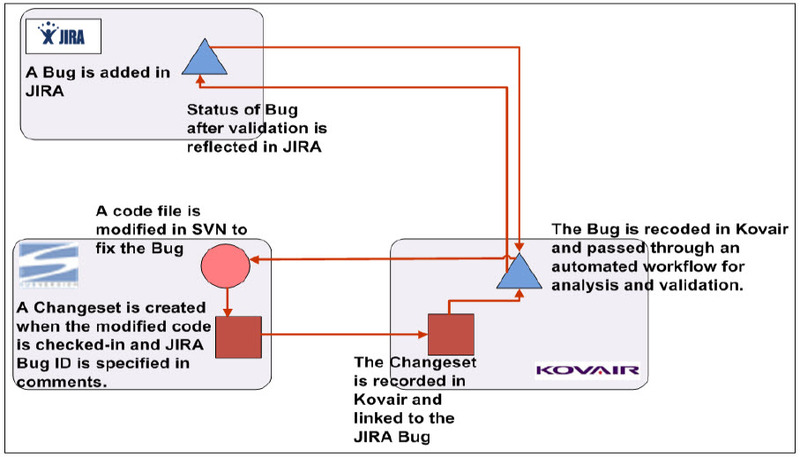 As shown in the above example, you can integrate SVN with Kovair and JIRA so that bugs in JIRA are replicated in Kovair and passed through automated workflows for analysis and validation. Validation status is reflected in JIRA. If the bug is valid, developers need to make changes in SVN files to fix the bug. Changesets corresponding to the source code files in SVN are replicated in Kovair and linked with the corresponding bug to achieve traceability. Fosters collaboration among dispersed development teams. Allows you to access specific versions or latest version of code snippets in SVN from other development tools. Allows you to access changeset and file version information from other tools. Allows you to collaborate with team members for document updates and handoffs. Easy to link changesets to any artifact in the integrated scenario using Kovair’s centralized repository for all artifacts.